Nicklas Backstrom made another step towards his full recovery today at practice. 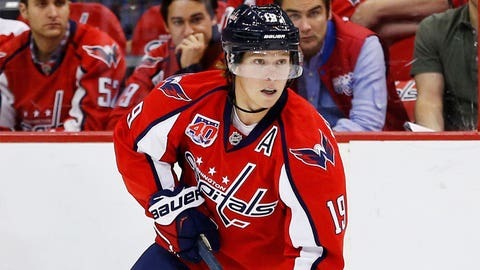 The Washington Capitals had to made their season debut without Nicklas Backstrom, their star forward who led the league in assists last season. Backstrom has been recovering from offseason arthroscopic hip surgery. His timetable on a return varied throughout the offseason. At first, he would miss a month. Then, it was ten or so games. Most recently, it was four or five games. Backstrom wore a red jersey at practice today instead of his baby blue uniform he's worn of late. A baby blue uniform signifies that a player won't participate in contact drills. The red means he will. Backstrom told the Washington Post's Isabelle Khurshudya after practice that he wasn't officially cleared for contact, but that he simply wore red so he could participate in more drills. The fact that he took a step towards full participation in practice is encouraging. The Capitals play their second game of the season Tuesday against the San Jose Sharks.